We see the bulk of human action as being composed of a limited number of irreducible fundamental movements. These fundamental movements we call functional. When you review the list of factors or exercises associated with significant neuroendocrine response, they largely or completely meet our requirements of being fundamental, elemental or irreducible, and universal to sport and life. Currently we see each major functional movement carrying with it a cardiorespiratory capacity that can be developed independently and in conjunction with other functional movements to provide a superior cardiorespiratory response. 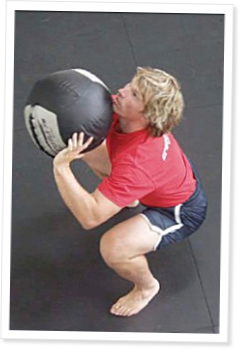 Our wall ball exercise uses a 20-pound Dynamax Medicine Ball and a flat vertical target located about 8-10 feet above the ground. The movement begins as a front squat and follows through to a push press/shove that sends the ball up and forward to the target from which it rebounds back to the throwers outstretched arms where it is “absorbed” back into the squat. When perfected, each shot looks identical to the one before, and the ball’s contact and departure are gentle and smooth. If the athlete endeavors to quiet the drill, the benefit to mechanics and breathing technique are immense. The wall ball drill comprises two highly functional classical weightlifting movements brought together at light loads and extended duration to create a super- potent metabolic conditioning tool with an enormous potential for increasing athletic performance. I had to post a comment, simply because I agree SOOO much. I am a chiropractor with a masters in Exercise Physiology. This mirrors what the PhD's teaching the exercise phys program as well as any fitness based course I took in my Chiropractic program, had said. It is laughable what is being taught as functional in the medical world, how rehabilitation typically ignores functionality out of fear; when it is ultimately that true pursuit of function that will create the best outcomes... FUNCTION! Sounds circular and ridiculous, but it is ridiculous that the world is being feigned into believing you somehow are going to pull last years flowers out of the ground, better, and with less pain, if you bounce on your theraball 5 minutes a day. I cannot tell you how many patients I have seen over the years who are self defined fit, yet they are weak, and when they go spread mulch for an afternoon, they are broken. I have attempted to put every single patient I see on to Crossfit for the last two years, and I will continue. I want a world of healthy, and functional people, and there is absolutely no better program yet, than Crossfit. God Bless you Coach! I approach my chiropractic message as Grass Roots, and Crossfit is Grass Roots as well. As soon as I can afford the time, I'll be launching an affiliate here to start pecking away at the elliptical fitness that currently rules the masses.